The Superman Fan Podcast: Episode #205: Superman Family Comic Book Cover Dated December 1956: Superman's Pal Jimmy Olsen #17! Episode #205: Superman Family Comic Book Cover Dated December 1956: Superman's Pal Jimmy Olsen #17! 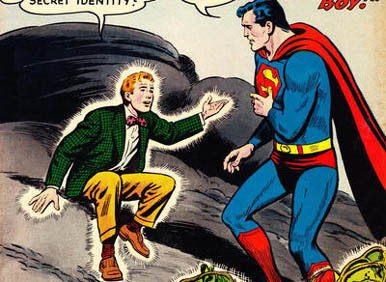 SUPERMAN'S PAL JIMMY OLSEN 17, December 1956, was published around October 16, 1956. It contained 32 pages for the cover price of a dime. The editor was Mort Weisinger, and the cover was pencilled by Curt Swan and inked by Stan Kaye. They were the art team for all three 8 page stories, which were all written by Otto Binder. These stories have been reprinted in SHOWCASE PRESENTS: SUPERMAN FAMILY vol. I. Elsewhere in DC Comics, 31 titles carried the December or December 1956/January 1957 cover date. Next Episode: SUPERMAN COMIC BOOKS COVER DATED FEBRUARY 1960: SUPERMAN 134 & ACTION COMICS 261! In 2 Weeks: SUPERMAN FAMILY COMIC BOOK COVER DATED JANUARY/FEBRUARY 1956: WORLD'S FINEST COMICS 86! NOTE: The host website for the SUPERMAN FAN PODCAST, MyPodcast.com, will cease operations on December 1, 2011. The new home for this podcast is http://supermanfanpodcast.wordpress.com/. New episodes will be posted on both feeds until then. The new WordPress feed has been submitted to iTunes. I will keep you updated about this change. Beginning November 11, 2011, check out http://www.clockworkcomics.co.uk/. Beginning Saturday, November 12, 2011, this website will begin posting the web comic book SLIPSTREAM, which I am drawing, and is drawn by Jeffrey Taylor, co-host of the FROM CRISIS TO CRISIS PODCAST. Thanks to Adam Dechanel, who is a contributor, along with Jeffrey, to the SUPERMAN HOMEPAGE website, for putting the website together. - The SUPERMAN PODCAST NETWORK at http://fortressofbaileytude.com/supermanpodcastnetwork !